Cucumber Avocado Toast is one of those things I eat for lunch whenever I need something fast yet delicious. It is so easy and hard to call it a real recipe. I just wanted to share the idea with you. Yes, calling this an idea rather than a recipe is much better. Sometimes we need ideas as well, don’t we? 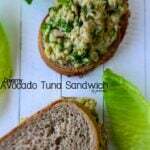 I’m sure you will love it if you are into healthy, quick and tasty lunch ideas. I hardly ever buy cucumber in winter, but it becomes one of the things I buy very often in summer. I’m in love with the refreshment it gives. And knowing that it has almost zero calorie makes me eat even more. It is one of my favorite snacks, I eat it as it is or sometimes I make Cucumber Salad. I was thinking that the best pair for cucumber is greek yogurt, but now I have another option; avocado. 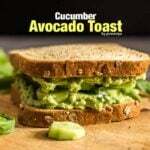 When you combine these two to make Cucumber Avocado Toast, you have one of the tastiest, easiest and healthiest lunches ever. To make my Cucumber Avocado Toast even healthier and filling, I used whole wheat bread coated with sunflower seeds and oats. Also to give extra refreshment to my sandwich, I add some fresh basil leaves. And this is a vegan sandwich, so even my food focused 2-year-old tasted and loved it! Mix mashed avocado with lemon juice. 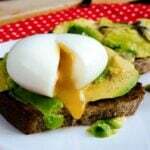 Slather mashed avocado on each bread slice. Place chopped basil leaves and cucumber slices. Eat either that way or sandwich the two bread slices. This turned out really good. I added sunflower seeds, small walnut pieces and craisins (dried cranberries), which seem to go well with basil and add some crunch. Thank you. Super ! I will try it for sure!!!! I LOVE avocado !!! Tried it. This was great and so easy.